SAP® migrations are a standard process nowadays. 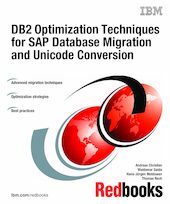 This IBM® Redbooks® publication describes optimization strategies and best practices for migrating SAP systems toward IBM DB2 for Linux, UNIX, and Windows, as well as for performing Unicode conversions. We discuss DB2-specific recommendations and best practices. This book is intended for experienced SAP migration consultants involved in operating system and database migrations or Unicode conversions, choosing IBM DB2 as a target database platform. It addresses the advanced SAP migration techniques, considerations for database layout and tuning, and unique DB2 capabilities such as compressing the target database while loading data. This book provides in-depth information about the best practices and recommendations for the source system database export, the advanced migration techniques, database layout and configuration, database import recommendations, SAP NetWeaver Business Warehouse, as well as background information about Unicode. We summarize our recommendations in one chapter that can be used as a quick reference for experienced migration consultants.